Gasoline Fuel Injector Cleaner. This one does it all! "The Quickest, Easiest, Most Complete Gasoline Fuel Injector Cleaner Ever Invented." Which is the best Gasoline Fuel Injector Cleaner? The First Strongest, Complete Fuel Injector Cleaner. Works fast. Results return lost performance in minutes. You will feel, hear, feel, enjoy the results! The reason why? Mega Power cleans 6 affected engine areas - not just your injectors. 6 areas get dirty in your motor. Why not clean all 6 and get every part - there's hundreds of them, clean and functioning good as when new - that's when your car operated at it best. Keep it that way with Mega Power! Mega Power Diesel and Gas Fuel Injector Cleaning Product actually shows you the areas it cleans on its packaging. Sure, we're bragging! However, and more important is the fact we are the only company that engineers the research and chemistry for such vehicle problem solving. In some parts of the world, you need our products to keep the warranty of your Mercedes or BMER - that's because we can do the job the most respected understand needs done! However, here in America, they chose that you trash out your new car every few years and buy a new one when it acts up! 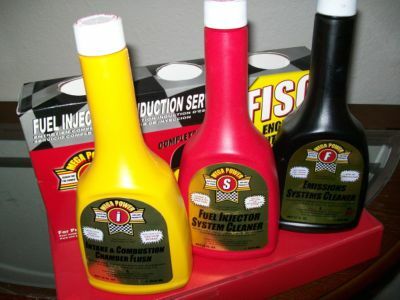 For those who want to keep their cars going strong - there's this Mega Power Diesel Gas Fuel Injector Cleaner called FISC. Mega Power FISC Diesel and Gasoline Fuel Injector Cleaner actually shows you the other areas of your motor it cleans on its packaging, beside fuel injectors. And you you just add it and drive for instant - guaranteed results! Now A $600 value for under $100. Order now! 6 areas get dirty in your motor. Why not clean all 6 and get every part cleaned - this Treatment includes cleaning of hundreds of parts - wherever fuel air combustion exhaust and oil goes! Clean and functioning good as when near new - to again get your car operating at it best. Order Now! Order one Mega Power 6 part Gasoline Fuel Injector Cleaning Treatment. Includes 6 items as shown, directions, phone help if needed, guarantee. Shipped direct to your door or business by FedEx in about 3 days. A $600 value, just $80 plus $15 shipping and handling. Total $95. Order one or more sets at this price. Clean and service your engine and transmission with this Special. Protect one or more cars and save $40. Includes 9 items needed. The 6 listed above [Just $95 total] and 3 Mega Power TS3 for your transmission protection and smoother shifting anti-wear. [Just $75 total]. Both for just $125 total shipped to your door. Order one or more sets at this price. Save $45. Offer subject to end at any time. Order both now! Why buy some other brand that can 't do the whole job - and cannot promise to get you back to normal driving of your car? You want and need all that help to protect and restore your cars great performance! So, FISC includes that extra help, too! By cleaning of your motors oiling system all other internal parts are cleaned by addition of Mega Power's Valve and Lifter Tune Up Additive . So that down deep in your cars oiling system where the heart of your motor gets its lubrication - every part is cleaned and conditioned good as when near new again. a wear reducing factor promoting years longer life - our customers tell us. Sure, its not part of your fuel system, but critical to your cars critical long-term operation and dependability. Mega Power is the once ever 2 year treatment me and tens of thousands of men and women car and equipment owners have found to be the best diesel and gas injector cleaner ever invented! A touch up treatment every 6000 miles at oil change interval replenishes the ingredients consumed for those most stressful areas under negative operation in your motor - and transmission, for that matter - if installed to assure it longer, cleaner life! Order now! Sent yo your hone in about 3 days by FedEx with easy-to-install directions - nothing to take apart. That is the difference between Mega Power and and all other brands that makes it the World 's Finest Gasoline Fuel Injector Cleaner. So effective, we put on e Rey package cleaning is good for 2 years! Mega Power covers 7 other areas that need to be cleaned if you want your motor smoothness, full power, and zip back. We also like this brand because it slows the rate of wear-out of your Gasoline motor to a slow, slow crawl. And, we like it because it improves transmission shifting by restoring motor compression and vacuum - a factor which alters or slows the shift timing, if low. If you need diesel injector cleaner, click here. This Mega Power Gasoline Fuel Injector Cleaner becomes our choice Treatment because it's more effective paired up with our MP ES#3 oiling system cleaner. It is a "kit" because the 6 items work together to do what other brands can't, but is needed for 5 other sub-systems, besides the cleaning of your motors dirty injectors. The yellow "I" bottle is fed into the motors air intake or a vacuum port. There it cleans a half dozen items wherever fuel, air, combustion and exhaust go. The red "S" bottle goes into the Gasoline tank. There it cleans the fuel tank, fuel filter, and fuel injectors. The black "F" bottle is added to the motor oil - for several cleaning and friction-modifying jobs that need to be done there. Stops After-run • Ends Loss of fuel economy • Does so in ten minutes or less time - you can see and feel it working! Excess Friction drag needs to be remove in the motor - the "F" product does this. That is where Mega Power Friction Modifiers stop up to 90% of all excess friction drag. This anti-wear factor in the "F" product releases power absorbed by such friction. The results restores a like-new performance again again. No other fuel injector cleaner has this great, engine helping advantage. Mega Power red product, cleans your fuel injectors to return the proper spray pattern to its proper fog-like spray. A power-improving, economy-improving benefit. All the items listed above are really the other half of what every good tune up really needs - but never gets! It may be all you need! The picture shows back of box and all the areas covered. Gasoline Fuel Injector Cleaner Details: Cleaning areas. 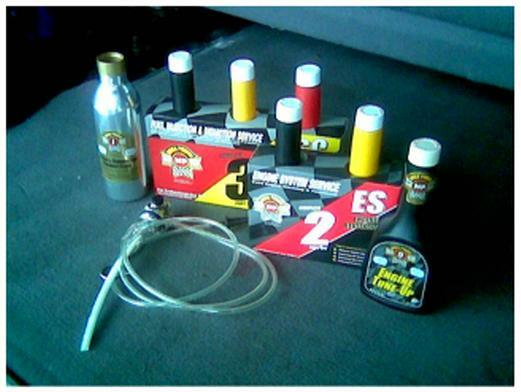 Click this link and see what I mean by removing friction, then come back and order this kit for your engines total care. 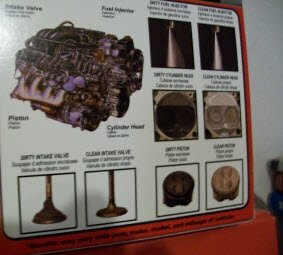 Not sold in parts store - just direct to mechanics, and people who want to clean their motors fuel injectors themselves - its easy my way, and want valve-freeing, friction-modifying, exhaust emission reduction, and combustion area cleaning - besides injector cleaning, for a 100% complete service. Clean your fuel injectors in minutes, get your Gasoline engine protected, end it performance problem - all at the same time. ORDERING INFORMATION AND PRICES. Comes with easy to follow instructions and a by-phone help - if needed. Liquid Feeder Tool. Feeds combustion cleaner into the motor is $99.00+ $15 S&h. USA. See the tool in action by clicking the 1st link below. Order 6 FISC Kits, get Free Shipping. Order by clicking button, or by phone 1-512-665-3388.